On April 4, a special meeting with one of the bereaved family members of Sewol Ferry tragedy victim was held at the College of Liberal Arts. 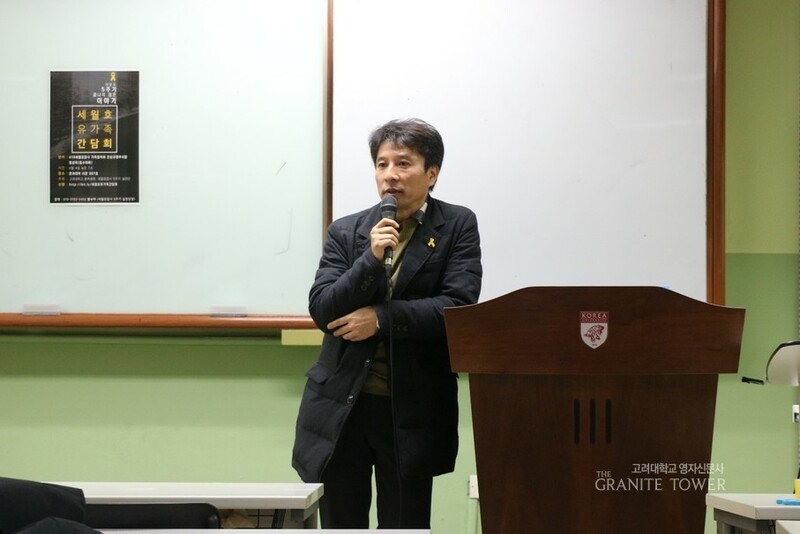 Held by Korea University Student Union (KUSU) and Sewol Ferry Tragedy Special Association, Jung Sung-wook, the father of the victim Jong Dong Su and current chief of 416 Sewol Ferry Tragedy Family Association came as a guest speaker. The purpose of this meeting was to explain the aftermath of the Sewol Ferry Tragedy and its significance to KU students. The meeting started with a brief video of people still remembering and lamenting the tragedy through songs and protests. Chief Jung said that truth is still befogged and suspicions regarding the research progress are deepening. Even though five years have passed from the incident, the cause of the accident is not identified at all. Thus, people in charge are not being punished and measures for safety supervisions to prevent similar accidents are still in process. Furthermore, chief Jung explained the physical and mental hardships that bereaved families have beared and criticized the negligence of the government. During the meeting, chief Jung encouraged students to ask questions. While answering different questions, he was consistent with one notion. "Students need to uphold their own perspective and act out.” He stressed that if they do not strive to maintain their unique perspective, students might just accommodating to others. Asserting that this increases their vulnerability, just as the Sewol Ferry tragedy proves, he encouraged the students to “be firm and consistent about what you think is true.” He hopes for students to stand in the center leading the change if improvements of current government procedure for safety and accident prevention are brought about.